Dimensions: height 72cm, length 80cm, depth 80cm, weight 8,25kg. Available colors: white, beige, teak, orange, red, light green, silver grey, dark grey. FORZA is a robust tilting table suitable for any use, inside or outside. FORZA is an excellent solution in the furnishing of patisseries, ice-cream parlors, bars or cafes. 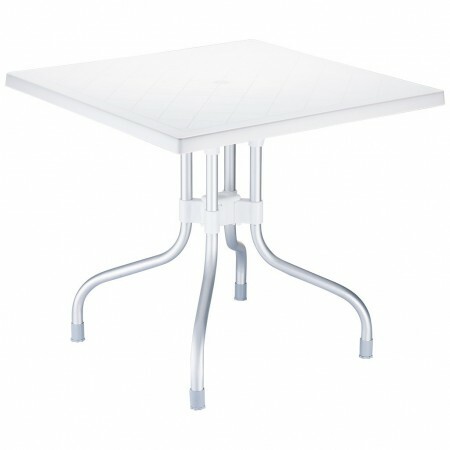 Built with polypropylene top and anodized aluminum legs with a diameter of 30mm. Extremely practical table because, thanks to the mechanism located under the top, it can be easily closed and stored, with a footprint of only 20cm (see images and video attachments). Designed to resist weathering and equipped with UV treatment.